Cheesecake are a band of talented musicians, vastly experiencend at playing to audiences and superbly good at what they do. Alexis is the main man, fronting the band, playing guitar, driving the van and answering the phone. He is the guy that will always be at any Cheesecake booking, answerable to the event and to the client. 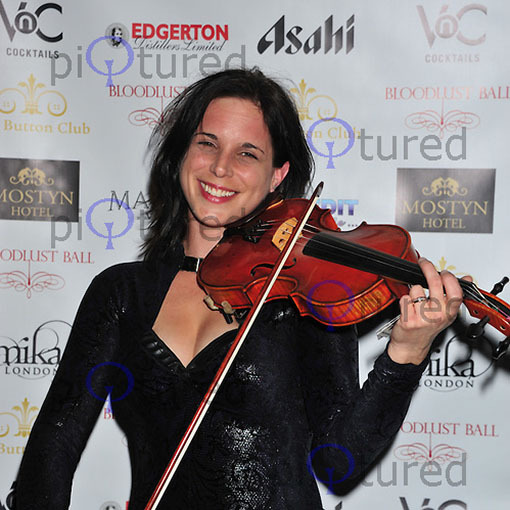 To ensure that the whole band at your event are not subject to the availability of any one particular musician, there are a pool of players, all trusted and highly capable, that gig regularly with Alexis. 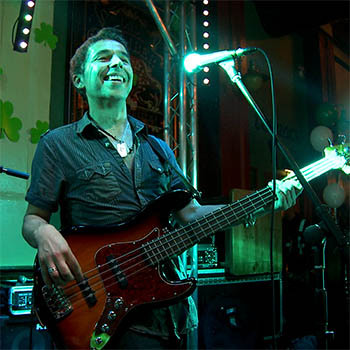 Album & live credits include touring and recording with Shane Macgowan and the Popes, going around the world at least twice with the acclaimed Riverdance show and many TV appearances. Ben is half French and half Irish, speaks both languages fluently, if not very comprehensibly, when drunk. Can also just about get by in English. Boy can he play though! 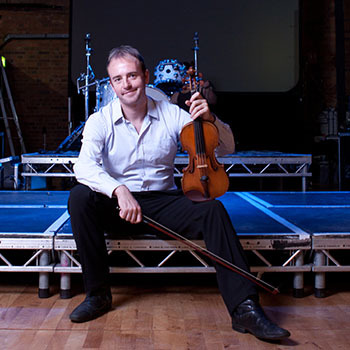 As well as rock gigs with Cheesecake he freelances as a classical session player. Based in Bristol but gigs all over UK. Scottish and with a gift for playing Ceilidhs and calling the dance steps at the same time as sawing out some fiendish fiddle tune. 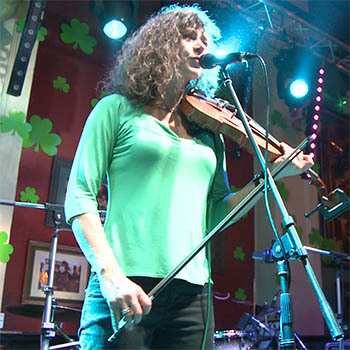 Irish fiddle player, singer. 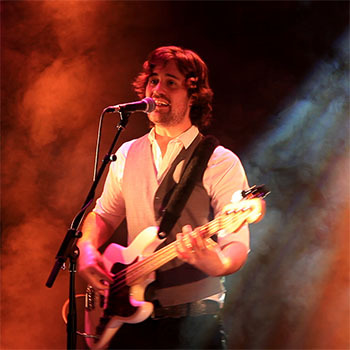 Has toured with all sorts of famous people including Shakira, and plays many types of venues, from small acoustic sessions to large arena events. Previous work includes playing a Burns Night in Iceland, Russian music for the Mafia in Beiruit, Princess Anne’s birthday party, playing Italian mandolin for a marriage proposal in Rome, fiddling with cossack dancers in Elton John’s back garden, playing for a line-dance in the French Alps, and doing a Jewish wedding in a pine forest in Athens. 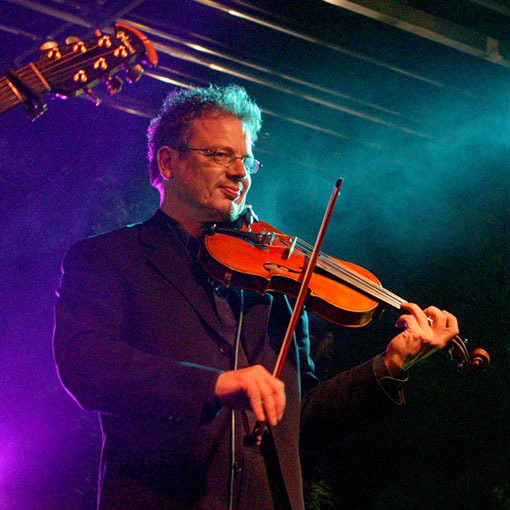 He has also appeared in an episode of the sitcom <em>My Family</em> as a Mariachi musician. A rich and chequered background. Sight-reads the guitar solo for The Final Countdown and plays it note perfect without breaking a sweat. 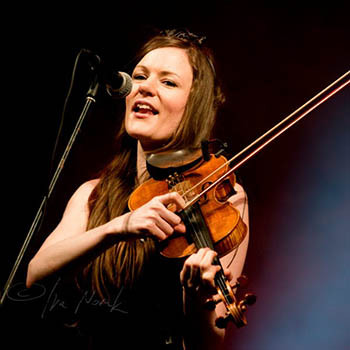 Her comfort zone is as first violinist in an orchestral string section but she has done a whole raft of gigs with us recently including our epic New Years Eve adventure, so the Irish tunes and Country fiddle things are becoming more familiar. Drummer with Cheesecake since its beginnings, still gigs with us if he is not modeling somewhere! F1Rocks event in Milan supporting Stereophonics, Radio 2 airplay – record of the week with Ben Montague album ‘Overcome’. 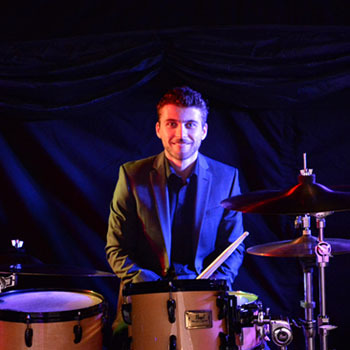 Jonty has been a professional drummer, session player and percussion teacher since leaving school, and a committed musician since childhood. 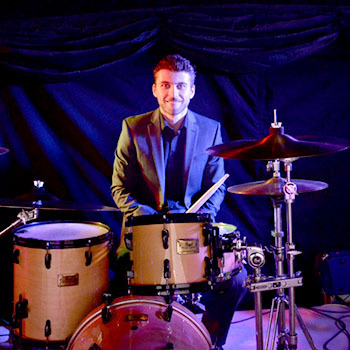 From west end shows to weddings to you name it, he’s played drums for it. 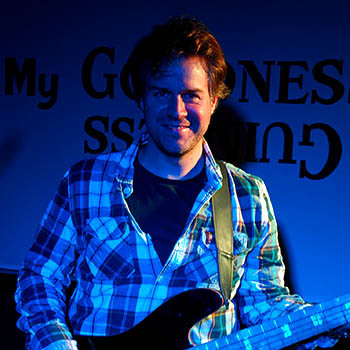 With a thorough musical training and education in guitar and bass, Rory plays and teaches both instruments professionally. He graduated from the prestigious Academy of Contemparay Music with a first class honours degree, and was named Guitarist of the Year by the academy in 2008. Monster bass player but he can also sing incredibly high and hit whatever that top note is at the end of Living on a Prayer. In a bizarre development, Grant’s work as a proffessional opera singer took a fortuitous lateral step when he stepped in to help out with a Christmas gig with the band and ended up doing a ton of gigs with us just after one season of Opera roles finished and before another began. 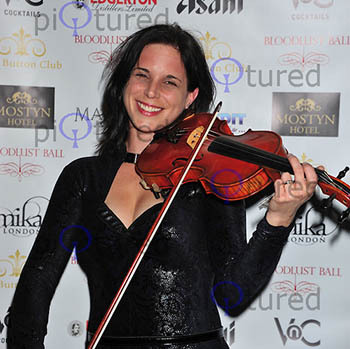 Talented string arranger as well. 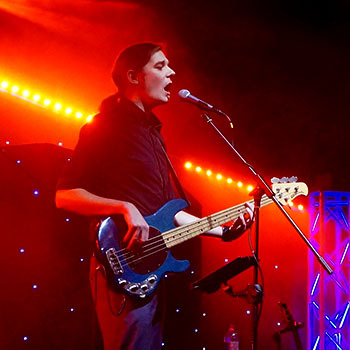 Danny writes music, works as a bass guitar player in various bands, and teaches bass guitar. 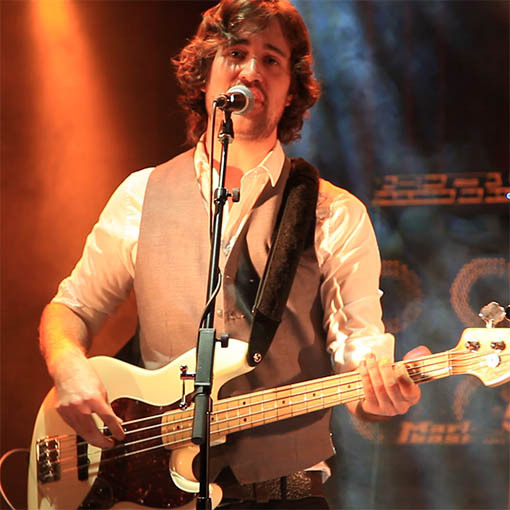 He first gigged with us last year while Rory was off on an epic road trip round the USA, and is another colleague of Jonty’s. 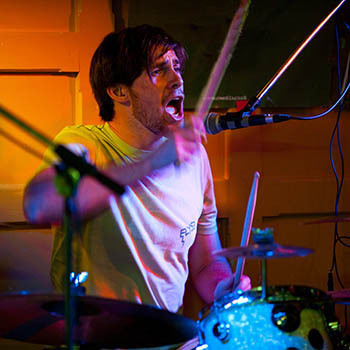 He has now played a load of gigs with us, including the surreal and wonderful night we played a birthday party and Jordan (Katie Price) turned up as a guest. Veteran of many a gig and musical project in collaboration with Alexis over the years. 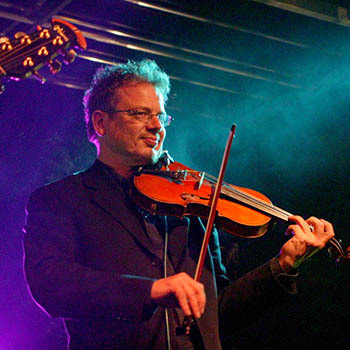 live credits include touring and recording with Shane Macgowan and the Popes, going around the world at least twice with the acclaimed Riverdance show and many TV appearances. Ben is half French and half Irish, speaks both languages fluently, if not very comprehensibly, when drunk. Can also just about get by in English. Boy can he play though! 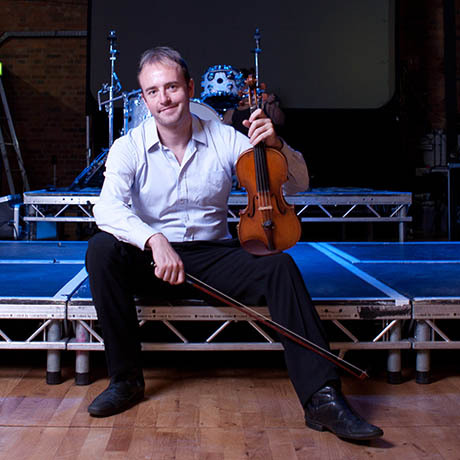 As well as rock gigs with Cheesecake he freelances as a classical session player. Scottish and with a gift for playing Ceilidhs and calling the dance steps at the same time as sawing out some fiendish fiddle tune. 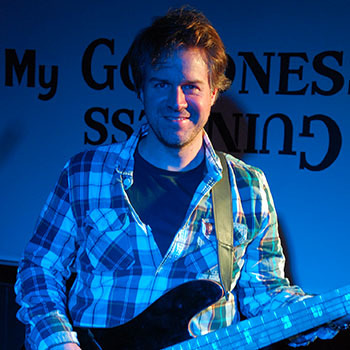 Irish born and bred, now living and working in London and gigging around the world. Last year worked with big names including Shakira on her world tour and George Michael promoting his most recent album. 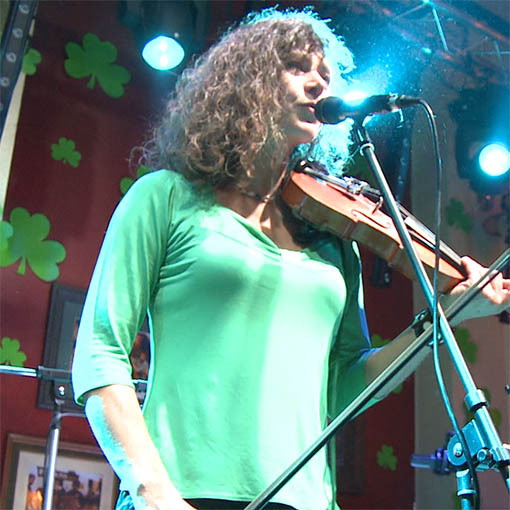 Natural affinity since birth for jigs and reels but can read music like you drink Guiness, except even faster and with less disastrous consequences. Previous work includes playing a Burns Night in Iceland, Russian music for the Mafia in Beiruit, Princess Anne’s birthday party, playing Italian mandolin for a marriage proposal in Rome, fiddling with cossack dancers in Elton John’s back garden, playing for a line-dance in the French Alps, and doing a Jewish wedding in a pine forest in Athens. He has also appeared in an episode of the sitcom My Family as a Mariachi musician. A rich and chequered background.. Weekend Wogan, F1Rocks event in Milan supporting Stereophonics, Radio 2 airplay – record of the week with Ben Montague album ‘Overcome’. 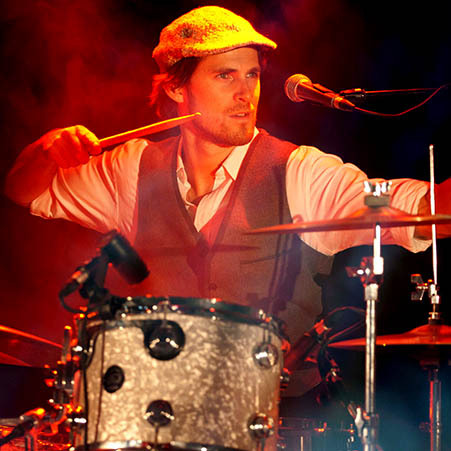 Jonty has been a professional drummer, session player and percussion teacher since leaving school, and a committed musician since childhood. His natural grooviness complements Rory’s bass playing superbly and is a key reason why the band work so well with the dancefloor.. 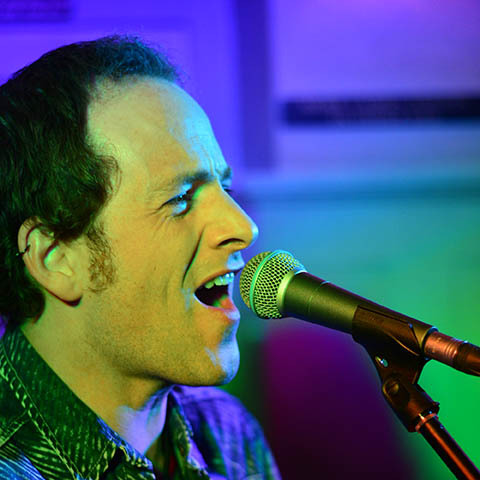 Started gigging with Cheesecake in 2015 and is now working with us pretty regularly. Probably the youngest and hippest member of the band. Which isn’t saying that much. Veteran of many a gig over the years with Alexis in one musical project or another.